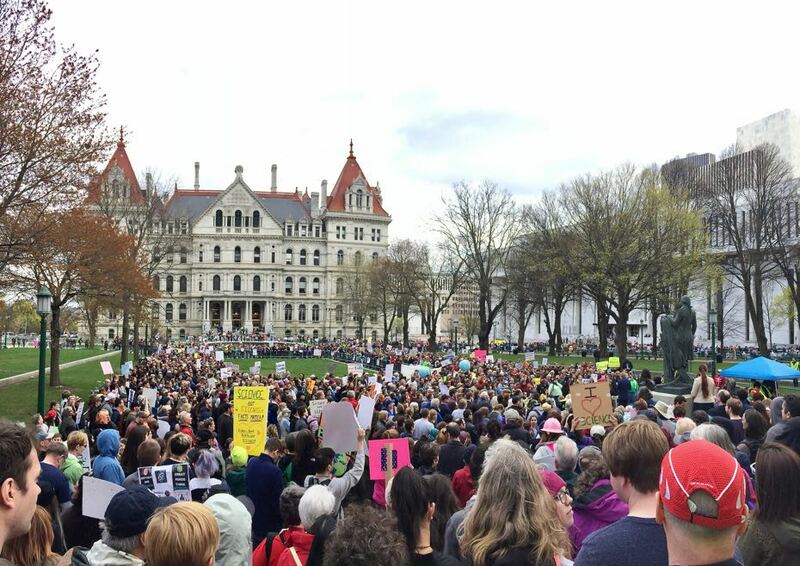 The crowd at last year's Albany March for Science. The Albany March for Science returns to West Capitol Park this Saturday. It's the second year for the event -- last year's event drew thousands of people rallying to support research funding and evidence-based public policy on issues such as climate change. This time around the event will again feature speakers, a march, and hands-on science activity tables. There are a bunch of local academic and research orgs backing event, including a new local non-profit called CapSci that's aiming to promote public understanding of science through all sorts of events. We talked with one of the organizers of this year's march -- Sarah Berke, an associate professor of biology at Siena -- about the motivation for a second march and... scientists in bars. Why a second Science March? Well it remains as important today as it has been. We need government leaders, we need elected officials to recognize the important role that science plays in public life. We need public policy to be based on science. And right now we're largely not seeing that. Can you give me some examples of places where that is falling through? Yes. So we're seeing a rollback of the environmental regulations, everything from pulling out of the Paris Accord to going backwards on fuel emission standards and the automobile industry, pulling back on endangered species protection, protections for public parks, national parks. These are all not the direction that we need to go. And we still need to see meaningful action on climate change. And in fact this administration as well as the administration is largely not only not taking action but also playing down climate change if not outright denying the reality of climate change. And those are all very concerning to us. We're talking about politicians, talking about government. But a lot of it seems to come back to the general public and that if maybe there was a different relationship between the general public and science we would see a different sort of politics. Do you think that's true? I think that that's partly what the march is about. It's showing that the public does support science, showing that members of the public care. The organizers of the march, some of us are scientists but others are not. And it's certainly true that in general I think you can argue that scientists need to do a better job of communicating to the public, communicating specific findings, and also just more generally communicating what science is all about. And that's something that we are -- the organization that's putting on the march, CapSci, is a new non-profit organization in the Capital Region -- and that's partly what we're trying to do. We're trying to bridge that gap between scientists and people who aren't scientists in order to help people understand at a deeper level what the scientific process is all about and what scientists do. "Scientists are incredibly hard working people who work who work really carefully to ensure that their data and their conclusions are well-supported empirically. And communicating that with the public is a really important part of what we do and it's something that we need to do better." Scientists are incredibly hard working people who work who work really carefully to ensure that their data and their conclusions are well-supported empirically. And communicating that with the public is a really important part of what we do and it's something that we need to do better. So how can that be done better, especially here on the local level? So one thing that CapSci is doing is just creating opportunities for people to interact with scientists. So one event that we've been running is called Science on Tap -- which I think All Over Albany has covered before -- and that brings scientists to bars. And we rotate between Albany, Schenectady, and Troy to give an informal talk followed by a question-and-answer session. They're free and open to the public, so it's an opportunity for people to meet scientists. Another event that we did last fall is called Two Scientists Walk Into a Bar, which is exactly what it sounds like. We had 50 scientists going to 14 bars across the region and they just went to happy hour. And the idea is just go to the bar and just talk to people and that worked really well and we're planning another one for later this year. So we're going to be doing these kinds of things to try to simultaneously get scientists out into the community more and also help them make sure that they're communicating well when they're out there. Is there a overarching message or takeaway that you want people to have from these interactions between the general public and scientists. First of all, I feel a lot of scientists push back on this distinction between scientists and the general public because they say, oh, well, I'm a scientist but I'm also a member of the general public. This divide is sort of a misnomer. Scientists are hard working, honest human beings just like every other human being on the planet. And the scientific method is a really powerful way of understanding patterns and understanding problems. And it's something that we can really use to advance just about every problem that we care about. April 24, 2018: A small section of this interview was removed to correct the status of some events. The 2018 Albany March for Science is Saturday, April 14 in West Capitol Park starting at 1 pm. The next Science on Tap event is Tuesday, April 24 at 7 pm at Slidin' Dirty in Schenectady. Cara Ocobock, an anthropologist from UAlbany, will be talking about the ways that humans manage extremes of environment and activity.